Wings of Tinodes cascadis redrawn from Schmid (1980, fig. 204). Wings of female of Marilia flexuosa redrawn from Schmid (fig. 723). (1980) Genera des trichoptères du Canada et des Ètats adjacents. Les insectes et arachnides du Canada, partie 7. Agric. Can. Publ., Ottawa, pp. 296. Wings of Discosmoecus atripes redrawn from Schmid (fig. 214). Hind wing of Homophylax andax male redrawn from Schmid (1980, fig. 495). Fore wing of Ecclisocosmoecus scylla male redrawn from Schmid (1980, fig.273). 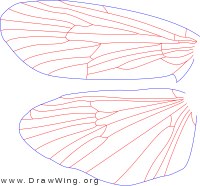 Wings of Psilotreta indecisa redrawn from Schmid(1980, fig. 711). Wings of Neureclipsis crepuscularis redrawn from Schmid (1980, Fig. 159) . Wings of Ecclisocosmoecus scylla redrawn from Schmid (1980, fig. 273) . Wings of Phryganea cinerea redrawn from Schmid (1980, fig. 585) . 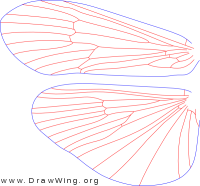 Wings of Chimarra obscura redrawn from Schmid (1980, fig. 103) .